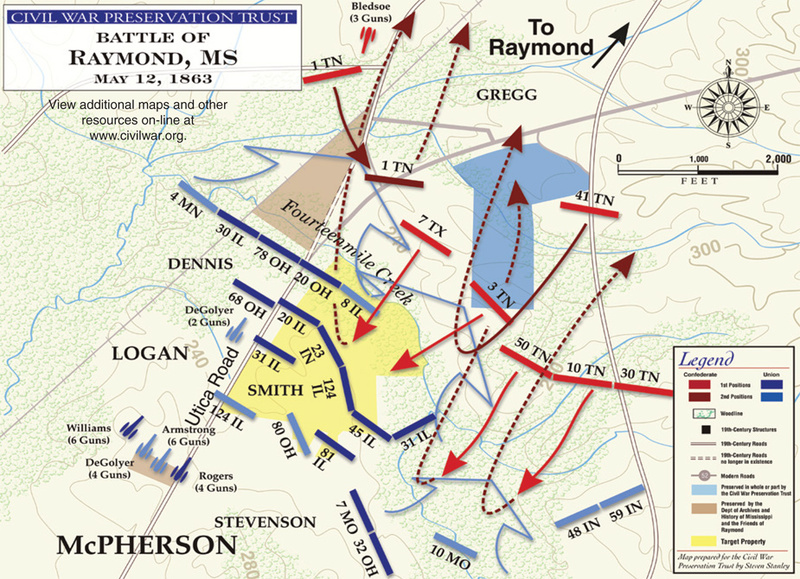 while Grant, with the left wing, was to attack from the east. stronghold on the Mississippi, ended in a complete failure. impossible to maneuver troops there with any degree of success. arrived and assumed command on Feb. 2, 1863. Maj.- Gens. John G. Parke, John A McClernand, William T.
composed of the 1st and 2nd divisions, commanded by Brig-Gens. Lauman's division was temporarily attached to the 15th corps. Brig-Gen. John McArthur, and the 7th by Brig-Gens. Isaac F.
Quinby, Marcellus M. Crocker and John E. Smith, successively. was the Mississippi Flotilla, under the command of Rear-Adm.
L. Stevenson, John H. Forney, Martin L. Smith and John S.
his force is too low. gaining the high ground on the Yazoo above Haynes, bluff. to return to the Mississippi. it began to look as if this expedition was to be successful. with a view to cutting off his retreat and capturing his gunboats. driving them back and extricating Porter from his predicament. rejected as too hazardous, defeat being almost certain. but if it succeeded at all the success would be overwhelming. short skirmish, and arriving at New Carthage on April 6. 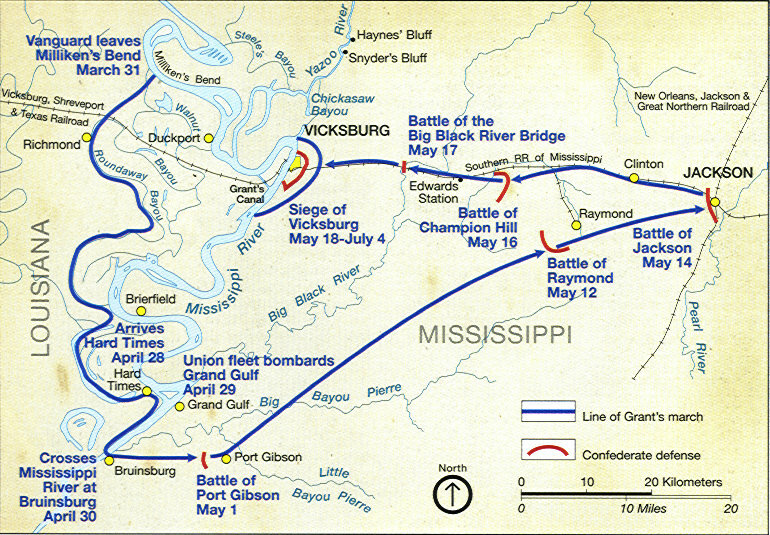 On the night of April 16, the fleet ran past the batteries at Vicksburg. where she sank soon after passing beyond the range of the guns. transports managed to get by without being seriously injured. where the enemy was met and overcome the next day. 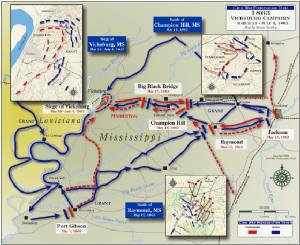 which their combined forces would move against Vicksburg. and then with a much smaller force than originally intended. 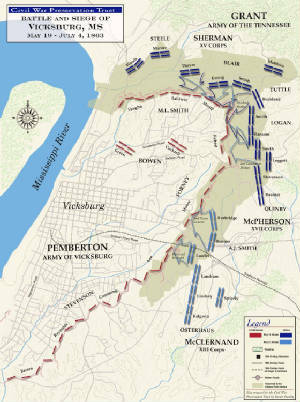 Grant's entire army turned westward toward Vicksburg. Bridgeport road against the enemy's position on Walnut hills. as complete as could be made with the forces at Grant's command. Yazoo river, where Grant had established a depot of supplies. half from the city. This was known as the Graveyard road. the Jackson road was the road leading to Baldwin's ferry. inside the parapet and opened a terrific fire on their assailants. position were unable to approach any nearer the enemy's works. outer line of works, but further progress seemed to be impossible. division again advanced, but was forced back with heavy loss. which doubts the facts subsequently, but too late, confirmed. Maj.-Gen. Ord in command of the 13th corps soon afterward. be reached Vicksburg Pemberton had surrendered. throwing 6 and 12 pound shells into the Confederate trenches. to charge through the breach, and at 3 p.m. the fuse was lighted. a warning voice, though it is the voice of a private soldier. works and hostilities along that portion of the line ceased. coming under another white flag toward the Union lines. march in one division as a guard, and take possession at 8 a.m.
4th the various commands moved outside and stacked their arms. 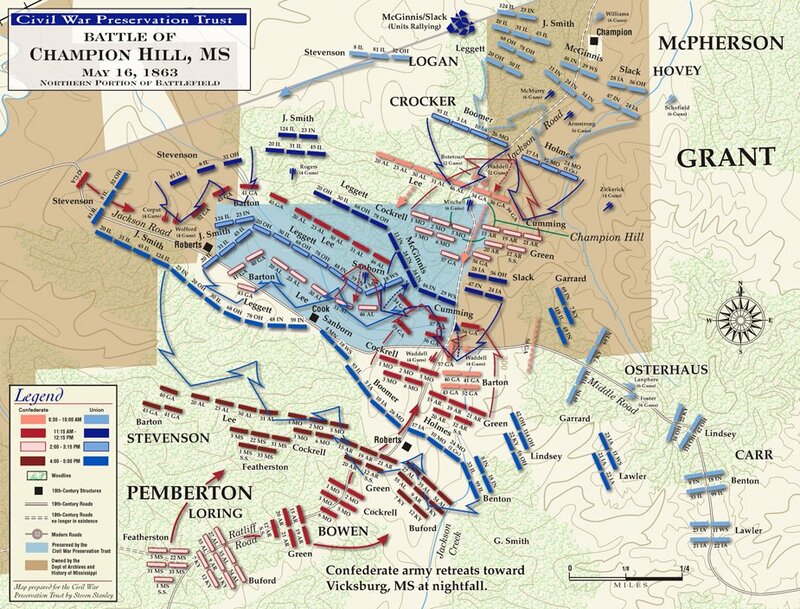 Recommended Reading: Ninety-Eight Days: A Geographer's View of the Vicksburg Campaign (Hardcover). Review: Why does virtually every military college from Sandhurst to West Point still study U.S. Grant's Vicksburg Campaign of 1863? “Logistics." As the author points out in his closing remarks, there is a widely accepted aphorism in military circles that says "amateurs study tactics, professionals study logistics." And the subject of logistics lies at the heart of this work. 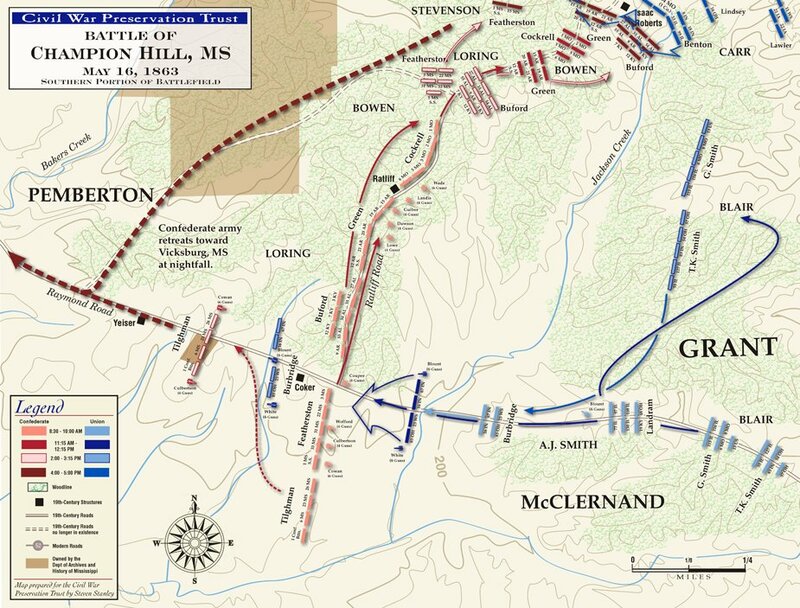 Logistics are the key, from Grant's preparations to move down the west bank of the Mississippi, through his close coordination with Admiral Porter to create an unprecedented joint Army-Navy operation, to his extended operations from Bruinsburg to the final investment of fortress Vicksburg. Continued below. This work presents this story, masterfully mixed with analysis and explanation of the importance of the terrain, the commanders, and factors such as unreliable communications, poor intelligence and uncertain maps. It also included other factors such as social and political effects and even personal vendettas, dislikes or personality flaws among key officers on both sides. The author, a professional geologist who spent most of his career in Vicksburg, also includes 68 high quality maps. These were painstakingly hand-tailored by the author in an effort to recreate the closest possible approximation of the actual 1863 landscape by combining modern geodesy with the best information sifted from records of the time. Grant or Pemberton would have traded nearly anything in their possession for such maps. The net result is a work that gives a much deeper understanding of the campaign and why the commanders involved made their respective decisions, which heretofore may have seemed baffling or highly questionable. As the author points out in his notes "About the Maps," when the events of the time are played out on this reconstructed game board the "opaque" decisions become "astonishingly transparent." One useful technique employed throughout is the author's presentation of each sequence of development from both the Union and the Confederate perspective. This allows us to see the details and the situation analysis from several points of view--which greatly enhance an understanding of the actions and reactions, moves and countermoves, of the opposing forces and commanders. There is also a generous sprinkling of background information explaining specific geographic, geologic or other situational factors as introductions to the Union and Confederate viewpoints. The book is rich in detail, from names of units to commanders and battle details, to the startling statistic that during the static phase of the siege from May 23 to July 4 Grant needed 338 wagons per day just to supply water for his men and horses. Now there's a logistical nightmare without even considering food, ammunition, medical supplies and all the other impedimenta of a military operation. Yet, all of this information is conveyed without ever bogging down in minutiae or boring the reader. This book takes an unconventional approach to present the fascinating tale of this unique campaign in a fashion you will experience nowhere else. The collection of information, writing, organization and presentation is in a word, superb.